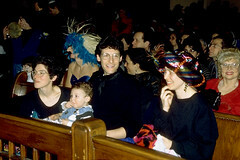 Purim begins, like other Jewish festivals, with an evening service. That service, however, is noisy and raucous, a festival complete with songs, costumes, and special baked treats. For example, one Pluralism Project researcher recalls an experience in the mid-1990s when the cavernous sanctuary at Congregation B’nai Jeshurun in New York City is filled to capacity well before the service begins. It is no ordinary congregation on this night. 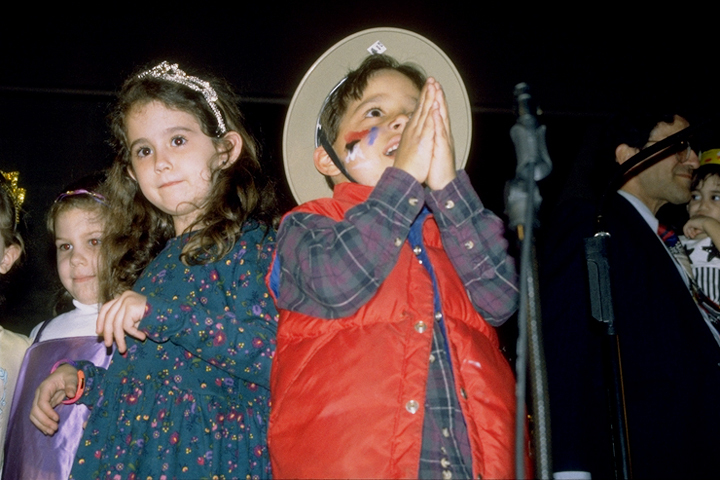 The young Jewish children who hand out programs are in costumes with painted faces. Celebrants will be offered a splash of face paint along with the program of the evening liturgy. The seats are packed, the aisles filled with costumed children: little queen Esthers with tights, skirts, veils, and nets pinned to their hair; little kings with crowns, jewels, charcoal beards; fairies, Bugs Bunnies, and GI Joes. Many adults are also in costume. One woman is dressed as a rabbit carrying a bouquet of carrots, while another is in a baker’s outfit and baker’s hat. A man walks in wearing a business suit, a solid gold face mask, and a brilliant purple kippah. When the service is due to begin, a man with white face paint and black stars around his eyes comes out in front of the noisy multitude, raises his arms, and asks for silence. It is the rabbi, in a comical costume of tight black satin pants, a black leather jacket with silver studs, and tall bright yellow cowboy boots. He plays the familiar opening chords of “I Can’t Get No Satisfaction” on his electric guitar and then begins the celebratory service with prayers. The central feature of the service is the reading of the entire book of Esther from a scroll called a megillah. It recounts the story of Jews in Diaspora in ancient Persia through the narrative of a young Jewish woman named Esther, who became the wife of the King of Persia while keeping her Jewish identity a secret. According to the traditional Jewish narrative, the beautiful Queen Esther had been raised by her older cousin Mordecai, a devout Jew; when the King’s vain adviser Haman insisted that everyone bow to him, Mordecai refused, for Jews bow only before God. Haman was so angry that he wanted not only to punish Mordecai, but to destroy the entire Jewish population of Persia. Haman cast lots (purim) to choose the date for the community’s destruction. When Mordecai heard that the King had agreed to Haman’s plan, he went to Esther to ask her to intercede on behalf of the Jews. Esther undertook a three-day fast, after which she revealed to the King Haman’s villainous plot, told him that she herself was Jewish, and asked him to spare her people. Consumed with anger, the King of Persia gave orders to hang his adviser Haman on the very gallows he had built for the Jews. In the end, the King elevated Mordecai to a position of great influence. During the Purim service, readers from the congregation—many still in costume—take turns reading the megillah. Back at the service at Congregation B’nai Jeshurun, one reader wears a glittering, many-colored turban, followed by a teenage girl in farmer’s overalls and a straw hat, and then a boy dressed as a leopard. When the name Haman is uttered, members of the congregation spin their clattering graggers (noisemakers), stomp their feet, and boo and hiss to drown out the very sound of the name of the man who plotted to destroy the Jews. Interspersed through the readings are loud renditions of the congregation’s favorite songs. Halfway through the reading, they sing to a familiar tune: “Half a megillah, half a megillah, half a megillah, still to be read…!” As the drama of Haman’s plot unfolds, the tension rises. Will the Jews survive his villainy? When the reading is finished at this particular service in New York, the “Purim Rock Drama” is enacted by children of the Hebrew School and members of the congregation, providing a lively rendition of the high-points of the Esther story. The spirit of festivity continues. Haman’s name, drowned out by noisemakers during the reading, is built into the very name of the traditional sweet pastries called Hamentashen, which are filled with apricot jam, prunes or poppy seeds and are folded to look like the three cornered hat worn by Haman. Giving to the poor and raising money for charity are traditional pillars of Purim, dating back to the Middle Ages, and are on a par with heading the megillah and having a festive banquet. 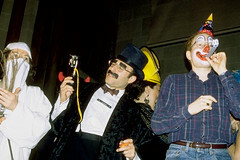 The Purim Charity Ball combining revelry and philanthropy has become a part of the American Purim tradition. Purim’s spirit of celebration is deeply linked with the drama of survival in which the community confronts the possibility of radical evil. But despite Purim’s rich cultural and religious significance, it is also a day on which the Jewish community pokes fun at itself and the seriousness of Judaism through humorous festivities.